Did you know Spoonflower is celebrating its 9th birthday this year? While we’re not quite at double digits, the community has grown to over 16,000 independent designers from all over the globe which means you can find exactly what you’re looking for when it comes to custom fabric, wallpaper and fabric. Looking for a llama design? No prob-llama. Need the perfect fabric for your donut themed party? Donut look anywhere else but our marketplace! We love connecting with our design community in emails for our Meet the Designer series and a highlight of our day is seeing what you’re making with #spoonflower on our favorite social channels. However, it’s not often we get the chance to meet with our design community in person. So, when the opportunity came our way to meet some of our fabulous designers and chat about all of the new things we have been up to help grow their earnings with us (like new distribution strategies with Etsy and Ebay), we knew we couldn’t miss the chance! 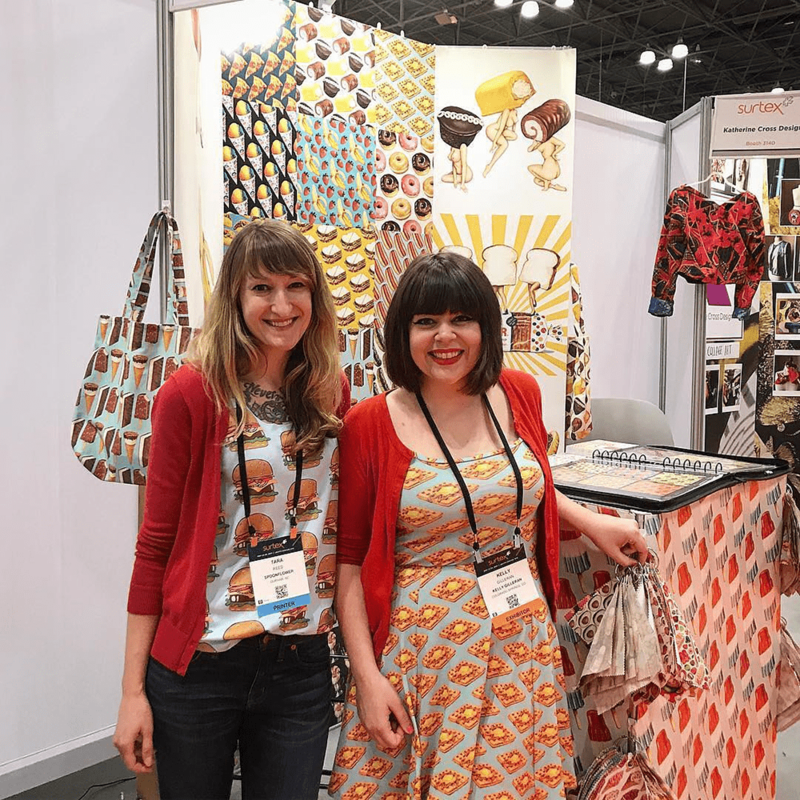 Follow along as Spoonflower’s President, Allison Sloan Polish, and Etsy Channel Manager + Designer Advocate, Tara ( aka Tarareed ), recap their trip to the 2017 Surtex show and say hello to the designer friends they met along the way! Great Spoonflower minds think alike! Tara and Marketplace designer kellygilleran are feeling the red cardi and food inspired ensemble at Surtex!